Every mail center should have a packaging center for small packages and manifest console. Adjustable shelves to keep boxes and packaging tape in front of you. For Adjustable Work Tables Click Here! • This system includes a 68" x 33" laminated work surface with T molded plastic edging. • Each table is adjustable from 29" to 36" for the perfect working height. • Top carton shelf hold 6 dividers for 5 different sized boxes or envelopes. 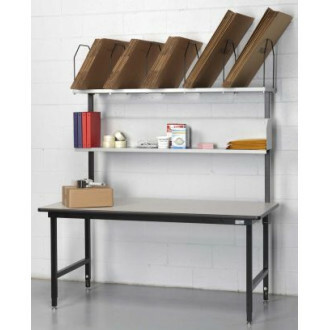 • Carton shelf is 15-1/2"D x 63- 3/4"W each wire support is 16"H.
• Middle storage shelf is 64" x 9" x 9-1/2"H and perfect for packing supplies, envelopes and informational binders. All of these shelves can be arranged as seen or rearranged to fit your exact need. Call us for the system you need.